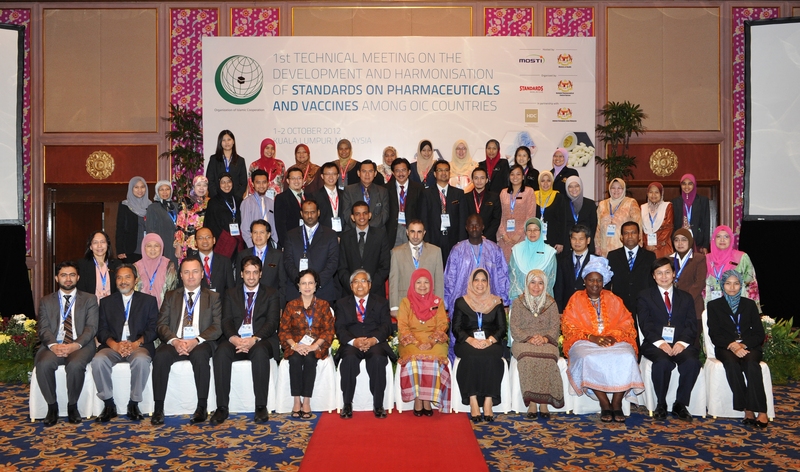 The First Technical Meeting on Development and Harmonization of Standards on Pharmaceuticals and Vaccines among OIC Member States was held in Kuala Lumpur, Malaysia from 1 to 2 October 2012. The meeting was jointly hosted by the Ministry of Science, Technology and Innovation, Malaysia and Ministry of Health, Malaysia in collaboration with the OIC General Secretariat. 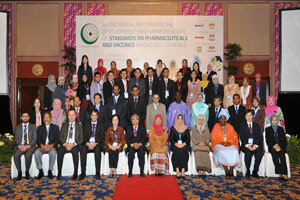 The meeting was attended by representatives of OIC Member States, OIC Institutions and International Organizations. SESRIC was represented at the meeting by Mazhar Hussain, Centre’s Researcher. In the opening session, Dr. Razley Mohd Nurdin, Director General of Department of Science and Technology in OIC General Secretariat, delivered the inaugural address and briefed the participants about the OIC level efforts to help Member States achieve the goal of self reliance in production of drugs and vaccines. Later on, the meeting was officiated by the Honorable Dato’ Sri Liow Tiong Lai, Minister of Health Malaysia who was represented by the Dato Eisah Abdul Rahman, Senior Director of pharmaceutical Services, Ministry of Health Malaysia. In his speech, the Minister welcomed the participants and stated that Malaysia as the 26th member of Pharmaceutical Inspection Cooperation Scheme (PIC/S) since 2000, has demonstrated compliance to the WHO’s standards on Good Manufacturing Practice (GMP). The Minster congratulated the Republic of Indonesia for gaining successful accession into PIC/S in July 2012 and said that Malaysia together with Indonesia can offer technical assistances and guidance on the area of GMP to other OIC Member States. He also highlighted the establishment of Halal standards in the manufacturing of pharmaceuticals in Malaysia referred as MS 2424:2012, which is used as guidance for Malaysian pharmaceutical companies intending to certify their products as Halal. In the first working session, Mr. Mazhar Hussain presented a report on Pharmaceutical Industry in OIC Member Countries: Production, Consumption and Trade. In his presentation, Mr. Hussain provided an overview of pharmaceutical production capacities of OIC Members and underlined their heavy reliance on imports to satisfy local demand. He also highlighted on lack of information and data on production and consumption of pharmaceuticals in OIC Member States. He proposed for OIC Member States to collaborate with each other and international organizations for the development of pharmaceutical industry. Later on, Dr. Samvel Azatyan from WHO provided information on WHO initiatives for ensuring quality of pharmaceutical products in various regions. In the second working session, representatives of Indonesia, Saudi Arabia and Malaysia shared their national experiences on pharmaceutical production and regulation. The speakers also highlighted some common challenges faced by Member States in producing pharmaceuticals and establishing WHO recommended regulatory environment. The 3rd working session was dedicated for discussing the Malaysian initiatives and practices related to pharmaceuticals and vaccine production. The speakers briefed the participants on standards and guidelines for manufacturing and supply of pharmaceuticals with regard to implementation of Good Manufacturing Practice (GMP) and Good Distribution Practice (GDP) in Malaysia. The mechanisms of procurement, supply and distribution of pharmaceuticals and vaccines in Ministry of Health Malaysia facilities were also presented and discussed in details. In the 4th working session, the meeting deliberated on the proposed structure of the Technical Committee for the Development and Harmonization of Standards on Pharmaceuticals and Vaccines (OIC-DHSVP). The meeting reviewed and adopted the draft Terms of Reference (ToR) on OIC-DHSVP and decided to circulate the ToR for the consideration of all OIC Member States. The meeting recommended establishment of a pro-tem committee comprising nine Member States representing Africa, Arab and Asia region. The meeting also agreed that establishment of relevant Technical Working Groups (TWGs) for the Technical Committee of OIC-DHSVP will be further deliberated by the pro-tem committee in December 2012. At the closing session, the participants unanimously adopted the report of the workshop and expressed their deep appreciation to the Ministry of Science, Technology and Innovation, Malaysia and Ministry of Health, Malaysia for warm hospitality and excellent arrangements for the meeting.